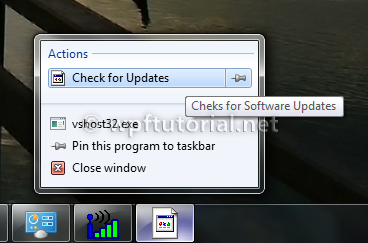 Windows 7 provides a new taskbar feature for applications called jumplists. They appear, when you right-click on a application icon in the taskbar. By default you see a list of recent files opened and two entries to launch and detach the application. .NET 4.0 provides a managed API that allows you to easily manipulate the entries in the jumplist. A jumplist is nothing more than a categorizes list of links to files that can be launched by the user. The links are called JumpTasks. They can be parametrized with a title, description, icon, filepath and command line arguments. In the following sample I create a new JumpList and add a task to the list that launches the sample application, but with a command line argument. If the application is launched with an argument, it shows a MessageBox instead. is there only work in WPF? It does also work in Windows Forms under a .NET 4.x and Win7 environment. Any way you can implement this to standard run time? e.g. Have a command on the list (Red) that changes the background color of the form to Red?